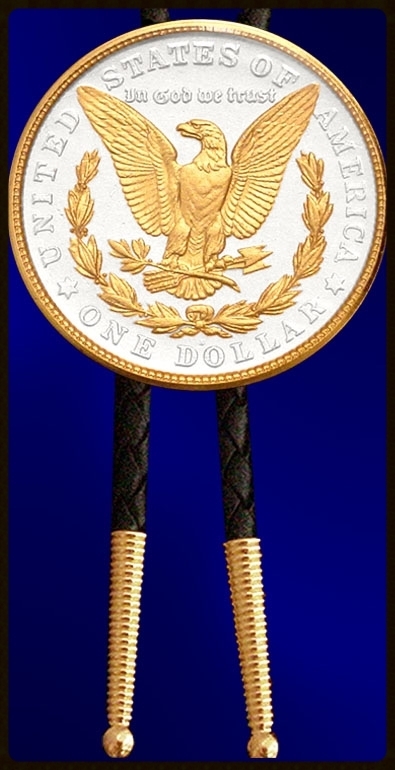 Silver Dollar Bolo(Bola) Tie. 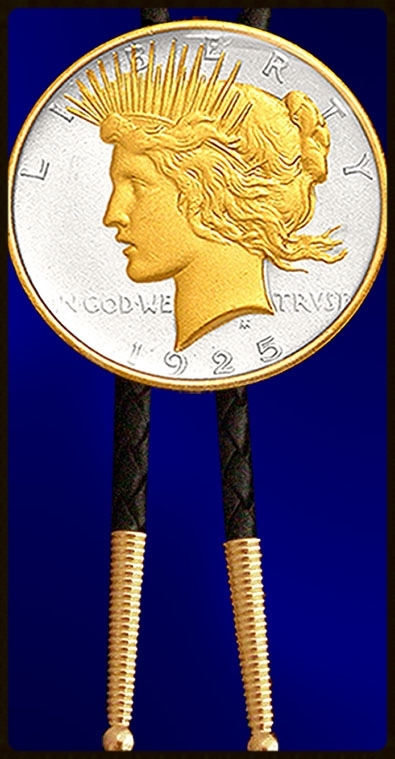 Your choice of coin is enhanced with 24K Gold highlights, preservedwith LensCote and comes gift boxed with two bolo cords, black and white/gold leatherette. 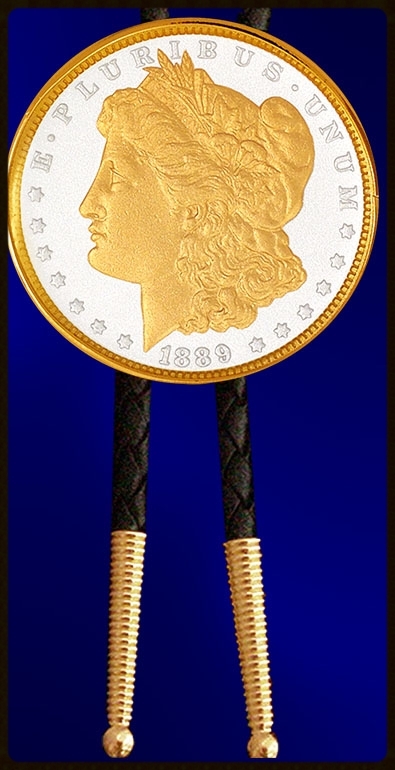 The Morgan Silver Dollar, first struck in 1878, is the oldest coin in the Aurista collection, all at least 100 years old! Settlers of America's Wild West would have been familiar with, and actually handled, these silver dollars, then commonly known as "Cartwheels." The Peace Dollar, named in reverence of the end of W.W.I, is the first US coin to show the influence of the Statue of Liberty, which by the early twentieth century had become a world symbol of American freedom and refuge. 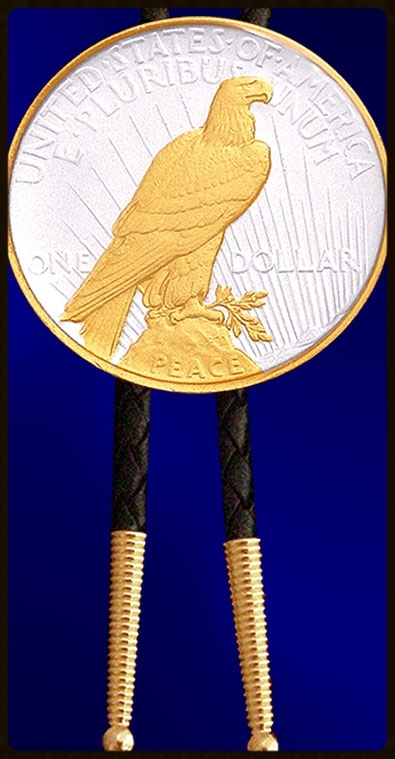 The reverse side features an American eagle with retracted wings, stately but non-aggressive. Your choice of coin is enhanced with 24K Gold highlights, preservedwith LensCote and comes gift boxed with two bolo cords, black and white/gold leatherette. Best Bolo tie I have. This tie really catches the eye. Anyone wearing a bolo tie will ask you about this tie. Glad I bought it. You are the best of the best. Thank you and your crew. Chief Jeff.Be Sure to Give my Thanks to everyone. Nothing but love..... XxxOoo.